My girlfriend and I were talking during our five hour car ride last weekend and she asked me if there was a goal or time in my life where I think I’ll feel like I’ve made it. Lucky for me, I get that feeling often. I do everything I can to chase moments that I know I’ll never be able to describe to someone who wasn’t there with me. If I’m unable to convey the feeling of the experience later in a conversation, I know that moment was real, true, and an important part of my life. Those moments can be large or small, they can last for hours or a fleeting moment. Many of them I’ve forgotten. Many of them I hold very close to me and can see them very vividly in my mind. A few I’ve been lucky enough to capture with a camera. The last couple of months I’ve had more than my share of these moments. My Arkansas trip was huge for me. 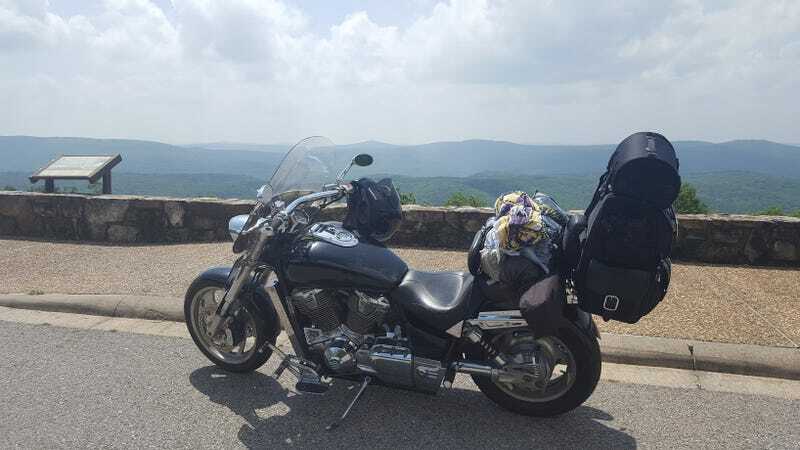 The top picture in this post made me sit by the bike and soak in what I was doing, as did the photo by the Arkansas state line. I had planned that trip the entire winter. Suddenly, I was living it, and I couldn’t believe it. The sense of accomplishment I felt at those moments were indescribable. That is why I ride a motorcycle. Of course, these moments aren’t limited to just motorcycles. They also don’t have to involve just me. The best part is being able to share that moment with someone else and having them feel the same way you do. I saw Jason Isbell for the second time a couple of weeks ago. I had seen him before, although my girlfriend hadn’t. She liked a couple of his songs but wasn’t a die hard like I was. When we walked out of the theatre, she was. His songs are incredible. His band is incredible. He is incredible. The songs, the lights, and 2,800 people all on the same page and enjoying the same experience is close to a religious experience. As we walked out, I turned to my girlfriend and asked “How would you describe the last two hours to someone who wasn’t here?” She didn’t have an answer. She had felt the same thing I had. NHRA at Brainerd International Raceway? Yep, gives me that same feeling. Took a friend with last year. Two Nitro Qualifying sessions, a walk through the pits, an up close warm-up, and fantastic weather the whole day. As we got into the car to leave, sweaty, half deaf, and tired, I asked him the question “How do you describe this to someone who wasn’t here?” Once again, he had no answer. He was hooked and totally understood why I go every year. Folks, do what makes you happy. Chase moments that you can’t describe to your friends. There’s nothing better than remembering a time where you felt unbridled joy while someone looks at you dumbfounded, thinking there’s no way they could do what you did and enjoy it. We’re all individuals. We have individual interests and find joy in different things. Pick up the hobby you’ve always wanted to try. Listen to the band your friends think is weird. Search out something unique that you can call your own. Don’t worry about what others think or say. Enjoy the things you want to enjoy, do those things often, and lead a happy life. Also, don’t even try describing those moments to others. Hold them dear and keep them around for you, and only you, to enjoy.